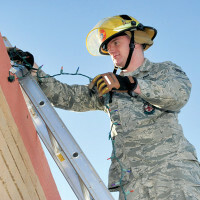 Senior Airman Grace Lee Airman Adarius Thurmond, 56th Civil Engineer Squadron Fire Services firefighter, inspects what is commonly known as the “jaws of life” or spreader, ensuring full range of motion at Luke Air Force Base. The Luke Fire Department checks lifesaving equipment daily, including axes, fire hoses, medical equipment and more. Posted December 10, 2015 by Story and photo by Tech. Sgt. LOUIS VEGA Jr.